Having already covered Americana and the 2016 election, 2016 Topps Garbage Pail Kids Prime Slime Trashy TV looks to an area that is especially ripe for parody. 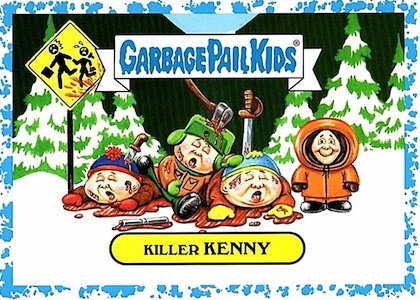 Technically the GPK Series 2 product for 2016, the set is again issued in two hobby formats. Collector's Edition Boxes boxes include one hit and there is also a standard Hobby box. Concentrating on the "Golden Age of Television," the product is built around a base set that contains A and B names for 110 subjects. Totaling 220 cards, parallels include Bruised (1 per pack; Collector only), Spit (#/99; Hobby/Collector), and Fool's Gold (#/50). While the basis of the set is the stickers, there is still a premium element in 2016 Topps Garbage Pail Kids Prime Slime Trashy TV. Collectors can find Printing Plates and Artist Autographs in all formats. Shaped Sketch cards are only available in Hobby or Collector's Edition boxes. Finally, Double Artist Panoramic Sketches, Parody Patch and Artist Relics are only issued in Collector's Edition boxes. Also found only in Hobby and Collector's Edition boxes, Garbage Pail Kids Wacky Packages merge the two entertainment sets into one playful insert. 2016 Garbage Pail Kids-Prime Slime -Tv-Magenta Printing Plate-Anderson 360! 220 cards, including 110 A and B names. PARALLEL CARDS: Bruised (1 per Collector pack), Blue Spit #/99 (Hobby/Collector Only), Red Blood #/75, Fool's Gold #/50, Printing Plates 1/1. 4 of 8 SLEEPY HAL O. 1 of 12 KIM KAR TRASHY N.
5 of 12 THE BIGGEST LOUISE R.
6 cards. Value box only. 8 cards. Hobby and Collector Only.